Any month that sees a personal best fish landed has to be classified as a red-letter month and December has certainly made up for the two previous months being almost non-starters. Fortunately the first session really got the month of in fine fettle and luckily I was treated to a days fishing on the famous Testwood Fishery by a very generous customer of mine. Our target was to catch the pinnacle of all our coarse river species, a 2lb roach and although we never achieved this goal, we came bloody close with myself taking five quality roach, all on the stick and pin, with the best going 1lb 13oz. It wasn’t just roach that showed, seven other species were taken including brown/sea trout, grayling, roach/bream hybrids, bronze bream, chub and one massive dace of 11oz that gave me a new personal best. For me the most pleasing part of the session was that I stuck with the float rod, stick float and centrepin all day and although come the end of the day cramp was setting in it was the most rewarding session I’ve had for a very long time. Booking the pool doesn’t come cheap at £150 but the cost can be divided up between a maximum of three anglers so it is affordable and will probably see a once yearly pilgrimage by myself and Alan to the venue. Unfortunately the second trip of the month bought me back to ground as although it wasn’t a blank it felt like it as I headed to a day ticket venue with big roach on my mind yet come the end of the day which saw my father and girlfriends father fish as well, apart from two roach around a pound to Mick all myself and dad had to show for our efforts were small frustrating roach. Anyway, just like Old Bury Hill it’s another venue that can be ticked of the list for the rest of the season. Back in November myself and fishing companion Chris had walked a stretch of the river Itchen and had spotted a big grayling and with a free Sunday morning we headed south full of anticipation. Before starting to fish I said that if we had half a dozen fish each the session could be classified as a result. Well in the second swim I settled I managed eighteen net fish mainly grayling and trout with the odd salmon parr thrown in. Chris was catching far less fish but seemed to have a knack of putting the net under far bigger fish with the best grayling going a good pound and a half plus. Just as we were rubbing our hands together thinking we had uncovered a gold mine and jogger on the far bank stopped and informed us that we were on a private, exclusive trout beat, ouch, that hurt. Amazingly we had walked the stretch the previous week and with our eyes concentrating on the water had both totally missed the private fishing sign. Time to leave I think! A trip to Hereford and the river Wye although not producing our desired species, pike, did provide me with a 50lb plus bag of chub. Not big fish, between 8oz and 2lb but brilliant sport and again all taken on the float, this time the waggler fished up in the water down the centre of the river. A couple of guiding days saw fish landed, the best fish being a 4lb 2oz chub taken from the Loddon in far from ideal conditions. The perch didn’t want to play ball and proved difficult on both flowing and still water. I did try for barbel on a flooded river Loddon, again without any success mainly due to the session being cut short due to the river rising and knowing that a stream that I struggled to get over on route to the river would most likely cut me off if I didn’t make a premature retreat. To be honest with the weather as it is, consistently mild and the rivers up in flood I’ve forgotten about barbel as these conditions allow the fish to feed when ever they want and trying to get any consistent results is almost impossible. In fact I’ve just taken a picture of my back garden, its Christmas Eve and the river Blackwater is within inches of breaching my tackle shed. It’s the highest I have ever seen the river, maybe I should cast out a barbel bait and leave my receiver in the lounge! Checking my diary inputs I’ve been fortunate to get out on the bank on twelve occasions, these being split between personal sessions (8), features (1) and guiding (3) which again is a good split. These sessions total 67 hours, almost six hours per session which is acceptable knowing that each day only sees around eight hours of daylight. On a more positive note I have been fortunate to discover and catch a few specimen fish come the end of the month, yet as its early days and with the Christmas holidays stopping myself from getting out till the New Year I feel it best to keep these quiet for now, but just lets say December has been very kind! I may well get out and have pencilled in a session on Friday 27th as well as a customer promising to take me out sea fishing on Monday 30th, yet with storms forecasted I’m not holding my breath. 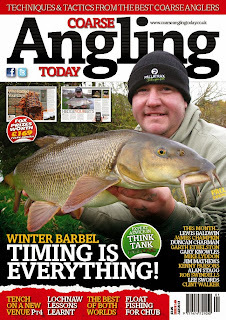 January edition of Coarse Angling Today out on the 27th December. 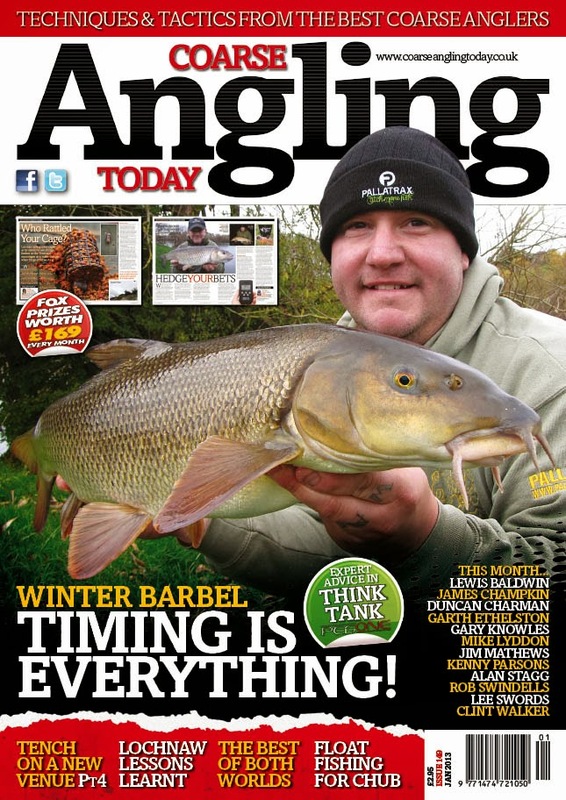 Anyone not familiar with CAT (Coarse Angling Today) need to get a copy of this monthly magazine as its filled with great content and features including Part 4 of my series title – Approaching tench on a new venue. I’ve been lucky enough to receive a copy well in advance and I was particularly interested in the HOTSEAT answers. To be honest when I started reading the answers I thought that I must have read the question incorrectly, yet I hadn’t. The answers just show a massive divide, and how some anglers are so selfish and single minded and are only worried what goes in their landing net, yet others, mainly us older mature anglers feel that the tackle shops and firms that provide what is needed to catch these fish are of up most importance as well as getting kids into our wonderful sport! It’s all well and good being ambitious and having goals but if the arse falls out from beneath us and you can’t buy maggots, boilies or pellets to catch those lovely big fish, then, well, you will know what it felt like when I was a youngster! There’s a bigger picture when it comes to ‘The world of Angling’ and we all need to look at it in a much broader way. In Session with Duncan – Thursday 19th December 2013. Venue – Badshot Lea Big Pond. Controlling club – Farnham Angling Society. Anyone that’s fished the Helicopter rig at Badshot Lea Big Pond in early spring will know just how good this method is and the exceptional fishing that can be had. I fished this with fellow Nash angler Stuart Jupp back in April and that day fishing around fifty yards out from the swim that allows the centre of the lake to be reached at the end of the woods (not the one facing the island) he managed around 80lb of fish in just a few hours. It was his first ever session on the venue and the first time he had used the rig in such a delicate fashion yet with numerous bream, mostly around 4lb along with big hybrids, tench and the odd net perch he proved that with a little help anyone can bag up on this method and venue. Knowing the venue well and the variety of species it holds should mean it’s a good winter water so with this in mind I headed out knowing that I needed to get swim choice spot on. Unfortunately the weather was doing its best to limit my choice as a storm was brewing and with weather warnings across the south I knew that my session would have to be cut short due to sensibility kicking in! On arrival the wind was coming from the main car park and heading across the lake to the small pond, a south westerly. The temperature was just seven on arrival and on the increase, as were the storm clouds and wind. Even before arriving I knew that the fish in this lake follow the wind so the area to the right of both pins was my chosen area and the centre of the lake was where I needed to place my bait, however trying to fish with such a wind in my face or from the side wasn’t an option so with peg 57 free and with the wind coming from behind this swim was the obvious answer as well as offering some shelter. Tactics as mentioned earlier was the helicopter rig in conjunction with a groundbait feeder. Red maggots would be squashed within the feeder by placing groundbait to both ends, creating what’s known as a maggot sandwich and with two red maggots placed on a size 16 hook and the use of a three inch hooklink any fish that picked this up would almost certainly get hooked. The first item that needed sorting was the umbrella as the rain had arrived slightly earlier than forecasted. Having mixed the groundbait up the night before, wetted down and sieved, and with rods made up it was simply a case of filling the feeder and punching this out in the general direction of the island some sixty yards, something made easy by the strength of the wind. With both rods out it was a case of working the swim as best I could in such conditions so every fifteen minutes the feeders were refilled and cast back out to the same spot as by now elasticised stop knots had been tied to the mainline and the reels line clip used. Forty five minutes past, three casts, before a couple of bleeps showed that fish were around yet it was another forty five minutes before the left hand indicator pulled tight before dropping to the ground resulting in a bream around 5lb. Over the next three hours four more similar sized bream graced my net, yet come 1pm it was a case of gritting my teeth, packing up in torrential rain and gale force winds and heading for shelter, yet this short exploratory session provided everything that I wanted of it. Badshot Lea is a brilliant early spring venue, however with a little thought and dedication its also a great winter water, I just wished that the conditions had allowed me to fish a whole day, however with the banks deserted it wont be long before l return. Unfortunately due to the adverse weather and holiday period I cant see myself getting out before the New Year, well not to create a weekly ‘In Session’ blog report, so to all my customers and readers have a great Christmas and here’s to a rod bending New Year. Anyone of my customers or visitors to my website interested in booking the famous Testwood Fishery which I visited recently can do so by calling Pete the river keeper direct on 07876 100027. The pool allows a maximum of three angler to fish at a cost of £150. Unfortunately my guidance isn’t allowed on this venue, however anyone booking and short of an angler please bare me in mind as I would love another day’s fishing on this incredible fishery and will be more than happy to impart my knowledge to help make your day a memorable one. Single Hooks and pre-baiting -The way forward for Pike. Too many, pike fishing is all about arriving at a venue, casting two deadbaits out then sitting behind motionless rods in the hope that one will spring into life. Sometimes it does, however long periods of time are spent waiting, yet having fished for most other species over the years I have learnt that by putting in some groundwork I can stack the odds in my favour of getting constant action to my rods. How do I do this, well let’s look at it like this. If I were going bream, carp or tench fishing then I would rarely, if ever, cast a single hookbait out then sit and await events to unfold. Why because it probably wouldn’t happen for many an hour, but this is in theory what I use to do, and many others still do when casting a deadbait out. Why did I ever treat pike, zander and eels so different to species such as bream? Maybe its because we take it for granted that other species are shoal fish and a shoal of fish need to be attracted and once feeding kept for as long as possible within the swim, yet zander, eels and pike also hunt in groups, so pre-baiting or introducing some attractants around the hookbait has to work in an anglers favour, albeit on a scale that wont do the opposite and overfeed your intended target or leave bits of fish decaying on the bottom. Fishing for other species has always meant baiting up, whether prior to getting my rods out or over a period of days, sometimes weeks and now I treat predators, especially pike with exactly the same mental attitude. The easiest way of understanding how certain species can be educated into feeding on certain baits, at certain times, can be seen with catfish as if the water is heavily carp fished and has lots of pellets going in, then catfish will take the easy option, stop exerting loads of energy chasing live fish and simply gorge themselves on this protein rich diet. Pike can be educated, just like catfish into feeding on certain food items simply by introducing a food source on a little and often basis and ensuring that the bait is deposited in the same spot at roughly the same time on every visit, however this doesn’t mean cutting ten mackerel in half and throwing them into a lake, a much more subtle approach needs to be introduced. Obviously an angler needs a starting point when pre-baiting for pike and this baiting approach seems to work better on venues with a good head of pike, rather than one that might just contain a couple of very large fish. The chosen swim maybe one that they have caught from before, seen another angler catch from or witnessed pike chasing fry, however if you have no clues then try and pick an area where pike can be drawn from lots of different directions. Before discussing what I introduce into the venue its worth mentioning that myself and plenty of other well respected pike anglers, as well as some predator venues are changing over from snap-tackle (two-treble traces) to smaller safer barbless single hook rigs with small baits hair-rigged. Wires available for pike fishing have moved on tremendously over the past decade and some are so good that they act more like braid and allow for numerous captures to be taken before they need to be change. These wires, like the titanium versions don’t come cheaply but the initial outlay will repay you over and over again as they last forever. Obviously the size of hook needs to be matched with the size of bait but its amazing how big pike will pick up relatively small objects once they have been educated to feeding on them and I have never had the need to use a hook bigger than a size two with size six and eights more commonplace. The fantastic advantage of using these small baits is that whilst educating pike into the swim and feed on them, other species will also switch on to them. I remember one session when I landed eighteen fish including pike, zander, carp and bream and have caught barbel of sardine sections in the depth of winter. Obviously the other great advantage of single hooks is fish welfare and rarely is a run missed, even when striking immediately. On most occasions the hook lodges within the scissors of the fishes mouth and can be removed without forceps, however if a fish is deep hooked, removing a single barbless hook will be far easier than a set of trebles. Don’t ever delay the strike as if a pike picks up your bait whether it be a section of sardine or kebab style set up then the odds of this and the hook being in its mouth are extremely high. To get the best from a swim then you need to be disciplined in how much, when, and how often you introduce bait. It doesn’t matter what you introduce, however if I were to fish a venue where the pike had a preference for naturals then this is what I would introduce, the same goes for if the venue’s pike preferred sardine, mackerel or something else, however cost needs to be thought of as well as availability of bait. I have always loved sardines and have struggled to find a venue that doesn’t respond to them, they are also relatively cheap from a supermarket. My pre-bait would consist of around half a dozen sardines, four of which are cut into fine sections around the size of your fingernail then the remainder cut into sections which will mimic my hookbait. I also add some dead maggots to attract fry, a teaspoon of salt (beats any expensive manufactured product) and a good helping of salmon oil. This may not seem a lot but introduce accurately into a swim will introduce loads of attractants and draw fish in from great distances. I use a Spomb to introduce this mix but if you don’t own one of these then the fish mix can be added to some groundbait, mixed into balls and catapulted into the swim. The few larger items of fish will eventually get the fish competing, looking for more, and after this concoction has been introduced over a period of time you can expect the action to be instant. The longer that you can bait up for then the better the results will be when you come to fish the swim, however once I have fished the swim and caught then I wouldn’t keep hammering it, preferring to start baiting again and leave for a week or so. If you are doing this on a couple of venues or in different swims on the same venue then you can skip between the two. How often and when will I bait up? If I could bait up every other day and at the same time I would but sometimes this isn’t possible however I would never let the swim go more than three days without being topped up. Something that I have had happen is other anglers dropping in on my hard work, so all my pre-baiting is done at dusk, or just into darkness as this will go unnoticed by other anglers as well as the wildfowl that have a tendency of picking the baits up if done in daylight. On some waters the pike will become nocturnal due to these introductions, on others thou they will feed at dawn, so you will need to fish both to find their preference and on the day of fishing I wont introduce any free offerings as I’m expecting the pike to be waiting for food and grab my hookbait straight away. Well there you have it, we fish for carp, bream, tench, almost every species in a similar way so theirs absolutely no reason why pike should be looked at differently. Give it a go you will be pleasantly surprised. When ‘A Passion for Angling’ was released back in 1993 it bought a breath of fresh air to how we viewed angling through TV. Was it the relationship between Chris Yates and Bob James that made this production so unique, probably, but for me it was their childish excitement of the thought of going fishing, wherever and whatever for that was simply enthralling? Add to the equation Hugh Miles and well it was recipe for success and although many times we’ve been promised follow up videos to surpass this, well let’s be honest, none have even come close. Well that was until I sat down one evening and watched ‘Magical Waters’ only to be completely drawn into another angling masterpiece and enthralled once again. Starring the late John Searl, artist extraordinaire and extreme passionate angler it was obvious that the initial seed was planted to create another masterpiece. Just the words describing water during the first few minutes captured my imagination and from then on it just oozed quality from start to finish. Filmed during the heat and height of each day so that the film could bring crystalline lighting quality, no wonder it took four years to create. Covering a multitude of different species from massive Avon barbel, chub and roach to the lady of the stream, grayling, captured in what I consider anglings finest elements, snow. Chasing truly amazing and rare wild carp to the most temperamental of our species, not quite coarse but in my book they classify, mullet. Big river carp and pike have always fascinated me and feature within this video and the venue I love more than any, Frensham Great Pond, well watching these guys just brings a smile to my face and the mix of under water footage, which is as good as I’ve ever seen, is just breath taking. Words that come to mind are visually stunning, elegant, humbling, passionate and atmospheric and if you loved ‘A Passion for Angling’ then you too will love ‘Magical Waters’. Venue – River Wye, Hereford. Controlling club – H&DAA. Full adult trout/coarse £50 concessions apply. Last year I found myself on the banks of the river Wye in Hereford at the same time that the last day of the Wye Festival Angling Match was coming to a conclusion. I watched as the anglers just upstream of the main road bridge swung in dace and small roach to hand, and then every now and again a big pike would show itself with flaring gills and a wide mouth as it tried to pinch one of the hook. I managed to make a few casts at the end of the match, yet the light was fading and as much as I thought that getting a take from one of these hungry monsters was inevitable, it failed to happen. Myself and angling companion Chris made a decision to return the following year as soon as the predator season opened, October 1st yet the un-seasonal autumn had yet to see the pikes annual pilgrimage to the deeper waters of the town stretch and our timing somewhat premature. Undeterred we decided to return, somewhat later than had planned and with Paul at Woodies tackle shop confirming that a few pike had arrived we headed back for a day session. With my van being somewhat unreliable Chris arrived in the early hours, 4.45am to be precise and a good run to Hereford saw us arriving just after 7am. After unloading the gear, and with Chris parking the car I found myself watching the water as the first rays of light started to illuminate this magical river and whilst doing so a couple of good fish moved, yet were they pike. Unfortunately not as soon after a salmon leaped clear of the water. Heading downstream we decided to start at the first swims upstream of the main road bridge then if nothing happened move half way up the lawn section finally finishing of just downstream of the old railway bridge. That was the plan anyway, however as dawn arrived the river came alive in front of us, not just loads of silver fish but pike as well chasing these in all directions. Once again it seemed that this was to be an easy challenge yet with Hereford and District AA banning the use of natural fish, live or dead trying to get a pike to slip up and take a sea bait was like winning the lottery. Fortunately I had bought a float rod as this section can produce not just big pike but large roach, dace, chub and perch and my hope was that maybe I could work the swim, get a few silver fish going and maybe just be fortunate to have a pike grab the bait and after a long fight land a monster pike. It was a long shot but far more likely than getting one to take a sardine! Having so many fish on the surface I started on a 6x4 stick with the shooting shirt button style and setting a depth of 3ft. I wasn’t quite sure of how deep it was just a rod length out but later plumbed it at around 12ft! Swinging the stick float out along with a few maggots it only travelled a few yards before disappearing and expecting a small dace or bleak to have grabbed the maggot was somewhat surprised when I found myself attached to a chub, not massive, around 10oz. This was followed by half a dozen more before they disappeared, however with the odd good fish rolling in the centre of the river I decided to change to a loaded waggler. Locking the bulk of the shot around the Drennan 2.5gram Loaded Insert Crystal +1BB Waggler and leaving just one small number 8 dropper shot I set the float at 3ft, placed a couple of maggots onto a size 16 Kamasan B525 before catapulted some maggots to the centre of the river and made my first cast. Almost immediately the float was gone and the bend in the rod showed that another chub was hooked, this time around 1lb 8oz. For the next couple of hours the action was hectic and come 11am when the shoal moved downstream I must have taken another thirty or more. Chris was by now scratching his head having tried every presentation possible, I had even popped up a sardine some four foot of the bottom right next to a small bush downstream. I could see the bait easily and time after time a pike would explode above it making me reach for the rod yet every time it was a natural it took. A couple of pike anglers were even working the far bank with big plugs, but even this tactic wasn’t fooling the pike. Probably two hours passed before small fish started to show again in front so having just a couple of hours of daylight left it was back to the waggler and come the end of the day a further forty chub had graced my net, all between 8oz and 2lb along with a few quality dace and annoying bleak. My only disappointment was that I hadn’t taken a keepnet as a catch like this would have made a fantastic front cover shot for Anglers Mail. I have to say that I have been missing fishing the float, yet after last weeks trip to the Test and a short session on the Itchen along with this phenomenal session in which over 50lb of chub came I have to say I’m not missing it anymore, I’m loving it. To be honest, I haven’t a great deal to write about the fishing during this month as it’s been appalling, all in all my worst run of form in my angling history. Trying to put my finger on exactly why I and so many others have been struggling is difficult, yet my thoughts go back to that horrid long cold spring we endured. Everything was late arriving and due to this many of our trees are still holding leaves when they should be bare. The weed in the rivers has been slow to die and break up and the lack or rain to wash this away and any wind or constant wind direction to clear the lake bed of decaying leaves has just made things almost impossible. I haven’t really helped myself as many of the venues I target are far from easy and the species targeted not always associated with autumn and winter, so by the time the month ended I can honestly say that I have learnt a few things. One species that most associate with winter are zander, yet as much as I though I knew when not and when to fish, I was proven wrong. In fact fishing Old Bury Hill I have now come to a conclusion that may sound strange. The venue hasn’t got a great deal of small fry in it and this is probably why a few years ago they switched on to sea deadbaits. Being a popular day ticket venue most days see a fair amount of anglers frequent it and with after dark fishing limited most predator anglers pack away at the best time of day, just as the light is fading. Throwing in their discarded bait the zander simply switch on, move in and have a feast and with the opening of the predator season being the 1st October and during this popular period its feasible to believe that just like carp, the lakes population of zeds go on a feeding binge, fattening up for the preceding winter and when the water drops below a certain temperature just go to ground. October is usually brilliant, I remember catching thirty eight zeds, including two twelve’s over two short evenings sessions a couple of years ago, however this year predator members were unable to capitalise on this after dark as due to restrictions and come November when these were lifted coincided with the period that they simple needn’t have fed. Unfortunately I tried on numerous occasions during the month and although we caught, the fishing was slow with just the odd fish showing and certainly no red-letter sessions. I did catch what I consider a specimen fish in the middle of the month but due to circumstances surrounding the session I found myself without a camera. I also spotted a very big grayling whilst walking a stretch of the river Itchen, certainly catchable but it was an exploration visit and I didn’t have my rod with me. Come the end of the month I was in need of a photograph so it I had to take the easy option and head to the river Loddon with a loaf of bread and as expected managed a couple of modest chub, yet ironically after struggling to catch all month when I did get one and hook a fish it was foul hooked in the tail. Fortunately an hour or so later one of 4lb 12oz graced my net and this time the hook was where it should be. In total I've found myself on the bank sixteen times throughout November. The sessions have been split between fishing for myself (11 sessions) and guiding (5 sessions) and have totalled some 76 hours, well down on previous months yet its that time of year when short sessions around dawn and dusk are best. Although no features have been created on the bank, back in the office it’s been a busy month, hence the reason for less time fishing, regarding features produced for Anglers Mail, Coarse Angling Today and European magazines. I’m glad to say that December has started on a far brighter note, mainly due to considering what venue to visit with far more thought and on my first session of the month managed to land a personal best grayling and some big roach. In Session with Duncan - Big roach and a personal best dace! In Session with Duncan – Tuesday 3rd December 2013. Venue – River Test, Testwood Pool. When one of my regular customers called asking if I would be interested in joining him for an all expenses paid day on the legendary Testwood Pool on the lower section of the river Test in Hampshire, well I didn’t have to think for long, a split second in fact. I instantly knew where he was referring to as just a week earlier had watched Matt Hayes fish the venue during one of his new Rod Race series. It was a bitterly cold day when Matt fished it, yet after dark he managed a couple of big roach ledgering in the main pool in front of the river keeper’s house. I was even fortunate to have a good chat with Martin Salter at the Sandown Carp Societies show just days prior to my outing. In fact Martin pinpointed three swims worth trying, two of which turned out to be right on the money. Having fished different beats of the river Itchen over the past decade and having learnt the art of using a centrepin I really wanted to use the float as much as possible. In fact I can honestly say that I’ve been missing using a float of any description over the past couple of seasons so with an ideal opportunity had packed a 15ft and 13ft float rod as well as loading the pin with new 3.6lb line and organising an array of floats and terminal tackle to cover every eventuality. The tip rod was also packed just in case the currents proved too demanding as well as prolonging the session with a few hours after dark ledgering. Wanting to protect the salmon parr maggots are banned so it was to be a bread and corn approach. As can be expected I didn’t sleep well and was lying in bed waiting for the alarm to sound at 5am! Alan was picking me up at 6am and when he arrived I was ready and waiting. The journey down went smoothly, apart from pinpointing the entrance to the fishery, yet we had allowed plenty of time and with the gates opening at 8am also found time to grab a coffee. The river keeper arrived bang on time and after a quick excursion of the pool and facilities we were eagerly threading line through eyes. Neither of us had much experience of fishing tidal stretches of river and both agreed that the prime roach feeding time would probably be high tide, yet even though it was low tide on arrival were still eager to get fishing. Knowing that directly in front of the house was a good area for roach Alan agreed to start here with me heading to the opposite bank as there was a long steady trot to the bridge, one that Martin had mentioned that to me screamed fish. By the time I settled down Alan was into his first trout, one of many that would come his way throughout the day. With the run in front of me steady I didn’t see the point of using a massive float so opted for a 6 x 4 stick with five number fours and two number six shot spaced out evenly in a shirt button style. With dace and roach on my mind I didn’t go for a hook that was too big either or one with a heavy gauge so settled for a pattern that has served me well in the past when grayling fishing, a size 14 Kamasan B525. A quick check of the depth with a large plummet showed around three and a half foot and I soon had a small handful of liquidised bread slowly dropping through the swim followed by my float and a small pinch of bread flake. Around three quarters of the way down the run, probably thirty five yards the float disappeared and pressing my thumb against the drum of the pin at the same time as making a short sharp strike saw the rod bend over. The fish didn’t feel that big, yet knowing that it could well be a personal best dace took things ever so steady and when the fish surfaced my heart missed a beat, however as it slid into the waiting net, what I first thought was a massive dace turned into a small chub. The next five trots down saw two slightly bigger chub landed, both bites coming from the same spot. Alan was making lots of splashing in the pool as trout after trout found his bait and soon realised that this position was going to be, what’s known as playing the numbers game, catch as many fish as possible and hopefully a big roach might turn up. I was in my element and was soon in the swing of feeding, dropping the float in this and watching the float head downstream. The swim was doing just enough to stop me moving, every now and again a bite would come and soon I was once again playing another small chub, or so I thought as when it graced my net I once again missed a heart beat as this time it was a big dace, a definite personal best. Alan popped round to take a few pictures and as he walked away I punched the air as dace have been on my mind for a few years, yet catching a big one had eluded me, not anymore. Knowing that dace are shoal fish I was expecting more yet it wasn’t to be, a loner for sure. Looking downstream and watching the tide come in, then the pool start to back up and the flow almost stopping and going the opposite direction is a strange feeling, yet with high tide almost upon us I was sure that a roach would show. A few trout and small grayling had showed yet the next fish felt altogether different and by the sheer weight l knew it couldn’t be a roach and sure enough it wasn’t but a modest bream. The effects of a couple of days on decaf coffee as well as concentrating on the float was having its effect so I decided to pop round to the fishing hut, make a proper coffee, chat with Alan then resume fishing. My shoulders, wrist and upper back were also beginning to ache yet I wasn’t going to stop float fishing and headed back just in time as I wasn’t expecting the tide to cover the grassy river bank and found most of my tackle in a few inches of water. This unexpected swim situation made me move upstream, to the second swim Martin had mentioned. He even remarked that if a cast three rod lengths out was made it was possible to guide the float out across the river and into the pool and he was right, yet this meant holding the rod high and keeping the line of the near bank torrent, more aggravation on the shoulders. With the float dragging under on the first few cast I kept taking a few inches of the depth and for some reason swapped the bait to corn. Obviously the fishing god was watching as the float disappeared and I found myself connected to a good fish, yet it was difficult to say what in the current. Gradually teasing the fish in I was able to manoeuvre it into the eddy to my left and it was then that a massive roach showed itself and I went into one of those jelly leg moments. A few anxious seconds passed before I was waving my arms like a madman to Alan and admiring what has to be one of the finest sights in angling, a big river roach. Alan took over my rod, the float disappeared and thinking it was the bottom just mended the line, momentarily feeling a fish. It’s something that I also learnt the hard way when trotting a stick and know strike on everything, even if I think it’s the bottom! Next cast and he was once again into a fish, yet it wasn’t to be his day as a trout turned up, followed by more. With a feeling that the roach would be showing in the pool he returned to the feeder only for myself to drop another couple of quality roach in the net, a few small grayling and a roach/bream hybrid that had me wishing all the way to the net. It was then that the trout switched on and numerous aerobatic sea and brownies plus the odd salmon engulfed whatever was placed in the river and soon with the water dropping and the current becoming to fast I decided to take a lunch break. The fascinating thing about fishing a tidal pool is its forever changing, your set up constantly tweaked and the fish within constantly on the move. I found myself using every ounce of my watercraft, often starring at the flow and current patterns to keep in touch with the fish. Alan was eager to get away from game and into coarse and headed to the far bank with the float rod, yet it just wasn’t his day as in swims that I g=had found few trout he seemed to be plagued by them, yet his persistence did provide him with a few grayling. I tried a few areas, yet the depth and speed of the flow was more suitable to the feeder more than the flaot and with limited time headed back to the far bank dropping into Alan’s swims as he moved out, yet apart from more trout just two chub came my way. I kept at it till I couldn’t see the float no longer before sitting next to Alan casting a feeder into the pool and extracting a small bream, much to his disapproval. When I quality roach found itself into my net I was expecting to get wet, more so when a nice chub followed, it was just my day, however Alan did manage a small chublet and the biggest of chub of the day just before it was time up. All in all a day of mixed emotion. For me it was not only fascinating but hugely rewarding, for Alan you could probably swap the fascinating with frustrating, yet he knows every angler has his day and after catching a 15lb plus barbel this season, one that I couldn’t catch, well he’s had his day! Well what’s happening next week, well it’s a river again this time with big pike in mind. I’d just like to say a massive thank you to Alan for his generosity, I owe you one mate! Venue – River Loddon, Stanford End. Controlling club – Farnham Angling Club. When I revert to having to use bread with chub my target it means only one thing and that is, it’s tough out there. Arriving at the river at 8am I find the car park empty and one look at the river tells me that I have made a sensible decision as its really low and clear with a tinge of green to it, however it feels strange as usually I emply this tactic when its really cold, yet today it’s a comfortable seven degrees at dawn. Putting my finger on exactly why the last six weeks has been probably the worst in my angling history is difficult but I blame the long cold spring and the short hot summer we had. Although some species of trees have dropped their leaves in the last couple of weeks others are still green and this slow drop into our lakes and rivers just isn’t conducive to catching as the rotting of these just sours the water and makes presenting a bait efficiently almost impossible at times. Its not just the trees that are causing a problem, it’s the weed as well as just take a look at the image taken which shows patches of weed still in the middle of the river. This should have gone weeks ago, yet its still giving the fish areas to hide within and you can bet that below this there is still an abundance of natural food. All in all not great, yet things can only get better and I’m hoping for a really cold winter then an early warm spring which should get things back to normal. Travelling light is essential if you want to cover as much ground as possible, so all I take is one rod a landing net along with a rucksack containing the essentials such as camera, scales & sling, bait, tackle box plus a couple of banksticks (rarely used). Having fished the stretch for years I have a couple of swims that I initially want to try as its always good to give the banker swims a go as this more often than not produces a couple of fish and sets the day up. This may mean walking far further than most as my best swims are rarely together, often being many hundreds of yards apart but fishing these before anyone else is the key to getting results. If you fish a swim after someone else then expect it to be ten times harder, in fact I rarely bother. Another area that many an angler needs to work on is the way they approach a swim as dropping all your gear right next to the river then waving the rod around as you set up as well as sending your shadow across the water will only spell disaster. I like to place my kit well back from the river bank, then take just what’s needed into the swim, often crawling in on all fours. I will have my rod in my right hand with the feeder loaded and flake already on the hook along with landing net in my left. The less movement made the more fish you will catch and attention also needs to be paid to the sound of how the feeder hits the surface. In fact their shouldn’t be any sound at all. With the feeder held in my left hand I just swing this out, almost laying it on the surface, then watch as the line fizzes across the surface then stops. This is when I click the bail arm, settle down and watch the rod tip. In some swim a bankstick, sometimes two will be needed, yet I always try to avoid using these and hold my rod, pointing the tip towards where I have positioned the bait and keeping it as still as possible. To be honest, more often than not if there are chub in the swim the bite will come within a couple of minutes so its no hardship to hold the rod and stay still especially as after ten minutes I will be moving on. If I get small pulls from cagey chub then I will pull six inches of line of the reel and hold this between my fingers and when the next pull comes give the fish this line, if the bite is still their after giving this out then hit it! Anyway enough about what to expect and do and back to the session. Creeping into the first swim I notice bread crumb pressed into the mud. Obviously it’s not just me that’s finding it tough and a sure sign that the swim was fished the night before, probably after dark as this would have been eaten by the birds during daylight. Swinging the rig out it land quietly, settles on the bottom and I take up a position just like a heron stalking its prey. Small pulls are forthcoming yet even after giving these some line the strikable bite fails to come so I move to my second best swim. This swim is far bigger and allows to casts to be made, one to the head of the pool where the water rushes in, and the other to the tail of the pool where it shallows up. The top produces nothing yet as soon as the feeder hits bottom at the rear of the pool the rod taps and pulls round yet on striking I instantly know that the fish has been fouled hooked and a chub around 3lb comes in backwards. I’m off the mark so to speak but not in the way I wanted so continue to drop a bait in another five swims before the next bite comes. Again the bite comes within seconds and on striking I know I’m into a much better fish. The swim is narrow and fast and all I can do is slowly ease the chub upstream. I’m using six pound Gardner HydoFlo line straight through, a Fox barbel rod fitted with a 2oz tip and a size 6 barbless Nash Fang Gaper hook easily capable of extracting whatever chub I hook, yet in the fast current if too much pressure is applied then there is always the chance of pulling the hook. Eventually a good chub slides into the net, not a monster but weighing 4lb 12oz it’s a result, especially after the spell I’ve been having. I try another two swims without any signs before a couple of anglers arrive, time to move on to another stretch, yet as I look downstream I can see an angler on the far bank and not wanting to cover covered ground decide to head to the Blackwater, a river far easier, yet the chub average smaller. It’s a long story but in brief I never made it to the river as my van broke down again so instead of the intended eight hour session had to settle for just three, yet still ample time to get the rod bending. A couple of important areas to pay attention to are the size of the feeder used. Basically use the smallest and lightest you can get away with. I usually use a tiny 10gram Drennan cage feeder filled with liquidised bread and when you get a bite strike as you need to set the hook. Im sure I will have to return with this approach later in the year, hopefully not because of a bad run of form but more in the hope of keeping a run going, yet this will certainly coincide with artic conditions as, the colder it is the better this tactic is. See you next week, hopefully with a monster roach!